The Ritron Clean Cab radio model RCCR is a dedicated manufacturing effort by one company with more than 30 years of RF engineering design and production experience. The combination of manufacturing know-how along with in-house mechanical, RF engineering and software skills work together to benefit our railroad customers' needs. The RCCR radio is designed with state of the art RF technology to provide onboard voice communication for freight and transit railroad operations. A fresh, clean-sheet design approach was used to optimize performance specifically for the railroad environment instead of adapting an off-the-shelf LMR mobile radio. 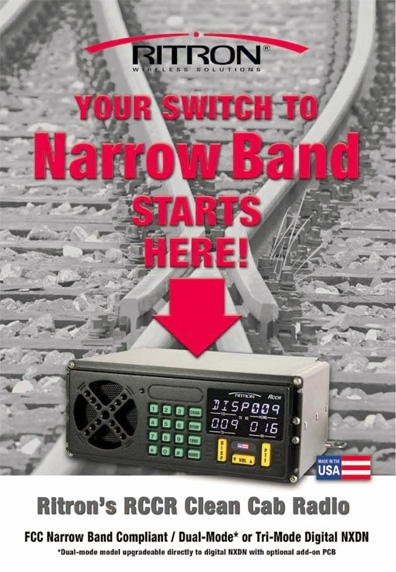 The radio is available in both 1 piece or 2 piece remote head models and is fully compliant with the January 1, 2013 FCC mandate for narrow band operation. It supports 25KHz (wide) and 12.5KHz (narrow) operation and can be easily upgraded via a plug-in board to support digital communication using the NXDN digital standard at 6.25KHz. The all-metal enclosure is made from heavy gage, precision-machined aluminum for maximum durability. A large bright, easy-to-read LED display allows for a wide viewing angle and ruggedness. Front panel push buttons are large and flush mounted to ensure correct entry and backlit for low light operation. Special emphasis has been given to easy access and serviceability of all internal PCB's and related electronics. 100% Designed, manufactured and supported by Ritron's factory located in Carmel, Indiana USA. Specialized Wireless Communication Equipment for the Railroad Industry since 1977. The LoudMouth wireless PA speaker is the ideal solution where a hard-wired PA installation is simply impossible, too expensive, or temporary. The LoudMouth allows you to use your portable 2-way radio, base station or mobile radio to deliver live voice messages directly to a PA speaker up to 2 miles away. Professional grade wireless communication... Keeping People Connected! • The LoudMouth radio receiver is small and lightweight (7"H x 5"W x 3"D, 2lbs). It is housed in a rugged, sealed, weather-resistant housing and includes a wall mounting bracket. The radio receiver should be mounted indoors away from the elements. • The indoor /outdoor 5.5 Watts horn speaker provides 95 dB of audio output @ 50 feet, so even in noisy environments you can get your message out loud and clear. The loud PA horn speaker includes a mounting bracket. 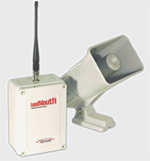 Put an end to uninvited visitors, vandals, and other potential security risks. Add the security, convenience, and productivity benefits of a Ritron GateGuard system to your facility today! 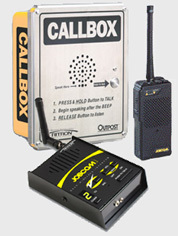 communication and remote gate control from a Ritron 2-way radio to any number of OutPost callboxes located at your facility. Keep gated areas SECURE! Communicate with visitors from anywhere on the premises before opening the gate remotely with a Ritron portable radio or desktop base station. 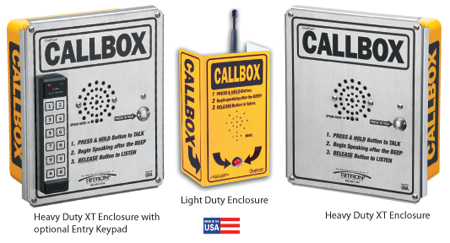 All OutPost Series Callboxes are available in Light Duty and Heavy Duty XT models. The Heavy Duty XT features a weather-resistant fiberglass enclosure, a stainless steel faceplate with tamper-resistant fasteners and a concealed antenna making it perfect to withstand any element. 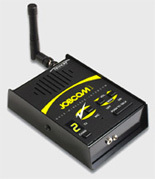 The JobCom Display Series Wireless Intercom/Base Station is a cost-effective way to keep employees in a fixed indoor location communicating and it replaces the need for multiple portable radios. Typically employees that work in a defined area, such as the machine shop, the reception lobby or customer service area, do not require their own portable radio, but they do need access to a radio. The JobCom Base Station doesn't get borrowed, dropped or stolen because it can be permanently mounted to a desk or wall. It does not require batteries since it operates on 110 VAC (or 12 VDC with optional adapter). Select from a list of 21 user selectable, pre-programmed business-only frequencies for your work group. The JOBCOM Base Station can also be PC programmed by your authorized Ritron dealer to operate on "custom" frequencies within the band of the radio.